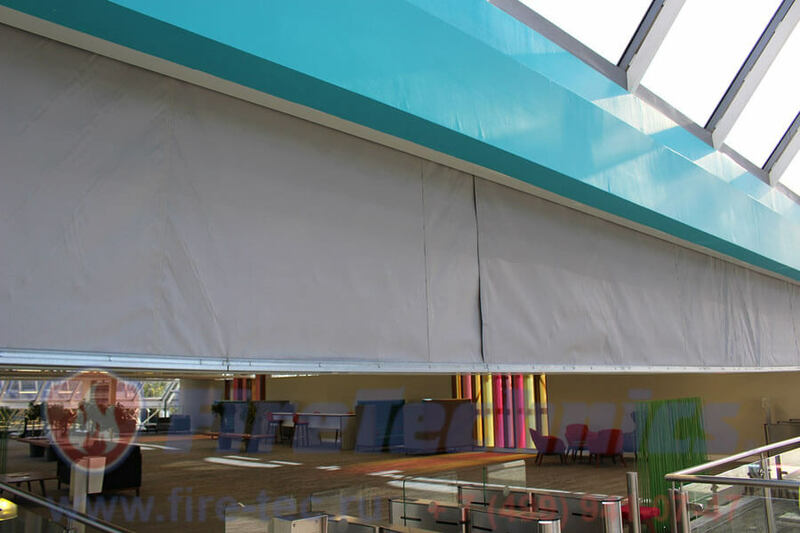 Fire-resistant automatic curtains of the type Fireshield EI120 (With water irrigation) are designed to divide the rooms into separate fire compartments and prevent the spread of fire throughout the building, thereby protecting people and property from the effects of fire and smoke. Lowering the curtains is due to the drive system Gravigen – without electricity, under the influence of gravity of the lower bar. The lowering speed is 0.15 m / s.
In the event of a power outage, the system remains functional for 72 hours due to the presence of an integrated battery in the control unit. Possible execution with a door-loophole. Lowering the blinds is due to the drive system Gravigen — no power, under the action of gravity the bottom bracket. The lowering speed is 0.15 m/s. When power outages, the system retains functionality for 72 hours with a control unit built-in battery. ♦ EI60 (one-way use of irrigation water from the existing sprinkler or deluge fire extinguishing systems of the building, water consumption is not less than 0.04 l/m2 per second). ♦ EI120 (one-way use of irrigation water from the existing sprinkler or deluge fire extinguishing systems of the building, water consumption of at least 0.08 l/m2 per second). ♦ EI180 (with double-sided water irrigation water flow 7.3 l/min per meter). Width, max. : 8 m. 18 m.
The lowering depth, max. 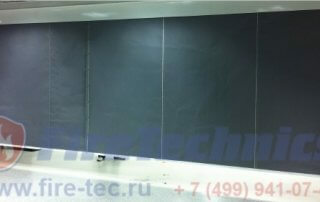 : 6 m. 9,5 m.
Box (depth x height) 150х150 mm. 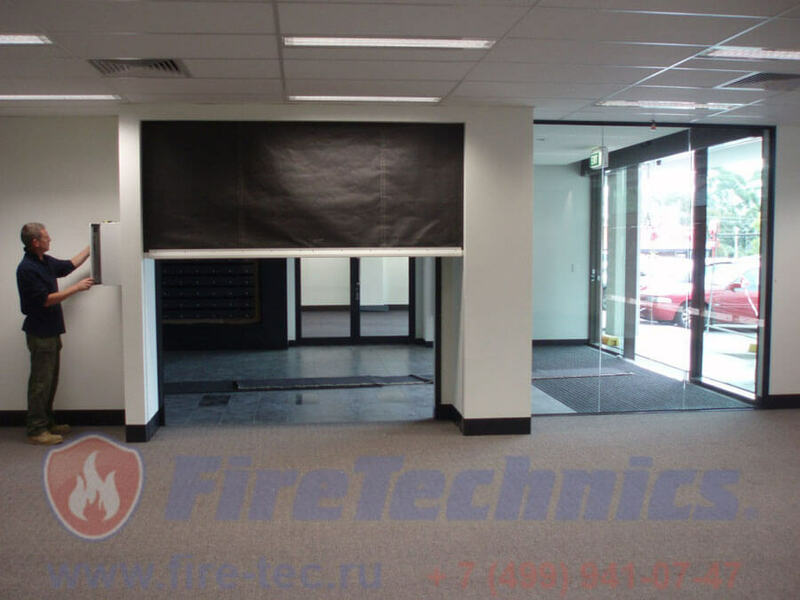 For accurate sizes please contact the managers of the company FireTechnics, depending on Your needs, we will be able to produce a fire roll-up doors on the individual sizes. Is made of galvanized sheet steel 1.5 mm. both ends of the housing closed with lids in order to make the contour of integrity, as well as for the perception of torque tubular motor. In the curtain Premium support rollers installed at intervals of 1.5 meters, excluding sagging of the shaft. Intended for the direction of the fabric unwinding from the shaft. Made of sheet steel 2 mm thick (casing — 1.5 mm). Inline rods have Fireshield Premium provide the necessary tightness, silent lowering and anti high pressure. Important! 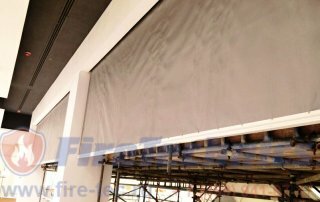 fireproof curtain type Fireshield EI60; EI120; EI180 (for irrigation water) are delivered to the object is almost assembled, which greatly facilitates the installation of fire curtains, increases the speed and correctness of execution of mounting and commissioning works. Fireproof curtains, Called also veils or barriers, the market appeared not so long ago. Created for the purpose of separating industrial, commercial and other large premises into improvised compartments in case of spontaneous combustion, they allow to fence off its hearth, thereby preventing fire, smoke and thermal divergence throughout the object area. 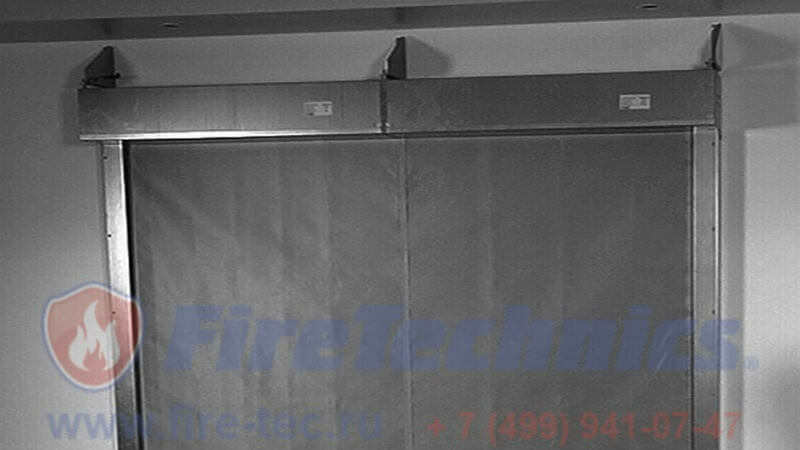 The time that the fire curtains in Voronezh restrain the elements is usually used to conduct human evacuation, as well as the accumulation of forces and means to eliminate the fire. 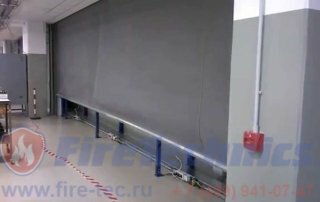 Fulfilling the role of peculiar obstacles, fire curtains, Moscow is blocking the room not permanently, but only in the event of an outbreak. Their thoughtful design allows you to keep veils at the usual time at the ceiling or walls, as a result of which they do not interfere with movement through the building. 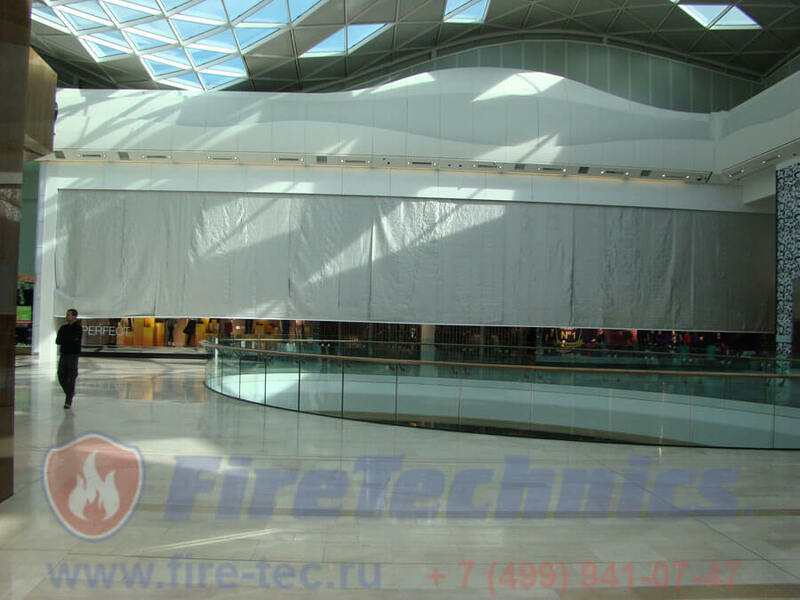 Being a fairly young method of providing fire protection, year after year installation of fire curtains Increasingly used in new construction projects, as well as in the reconstruction of already successfully operated buildings. They are equipped as production and storage areas, and cultural, domestic, public and educational institutions, office centers and various kinds of underground facilities. To be resistant to the effects of chemistry. 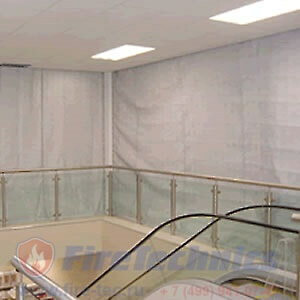 In the place of its location, the fire curtain, the photo of which can be seen on our website, is most often mounted in elevator and portal openings, as well as on windows. 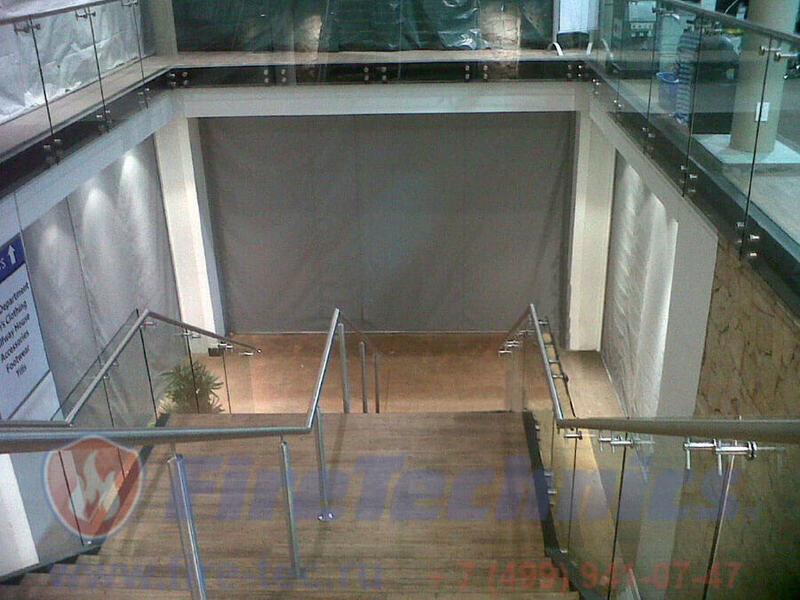 In addition, similar products can be installed in other openings, whose height reaches eight, and width – forty meters. In particular, their effective use is to separate large spaces into small fire compartments. 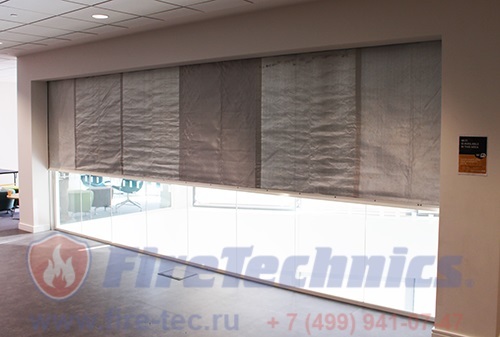 In this case, it is worth to you fireproof curtains to buy in Voronezh, and their use will not greatly harm the design of the interior, and also will not reduce their internal volume. 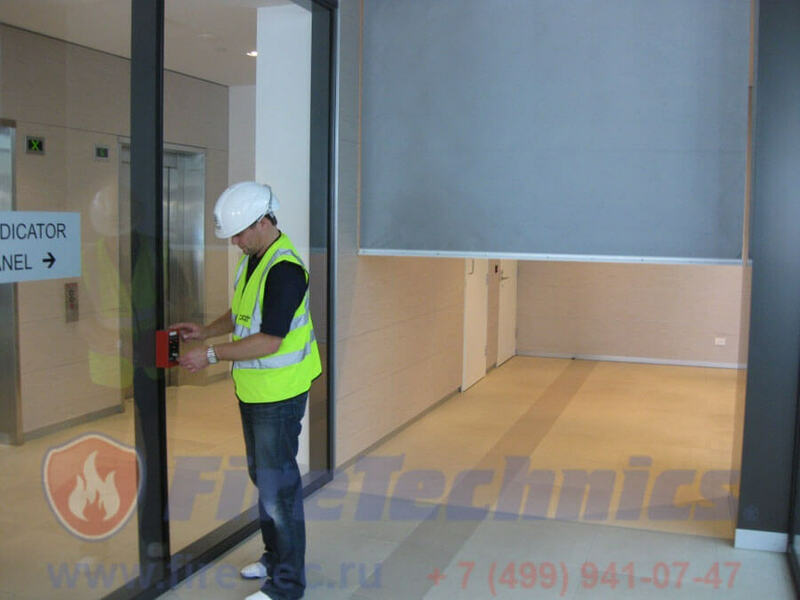 The development of the production of such structures has significantly expanded the scope of their application, and now they can be placed even on the facades of buildings in the neighborhood, in order to prevent the throwing of fire from one to another, etc. 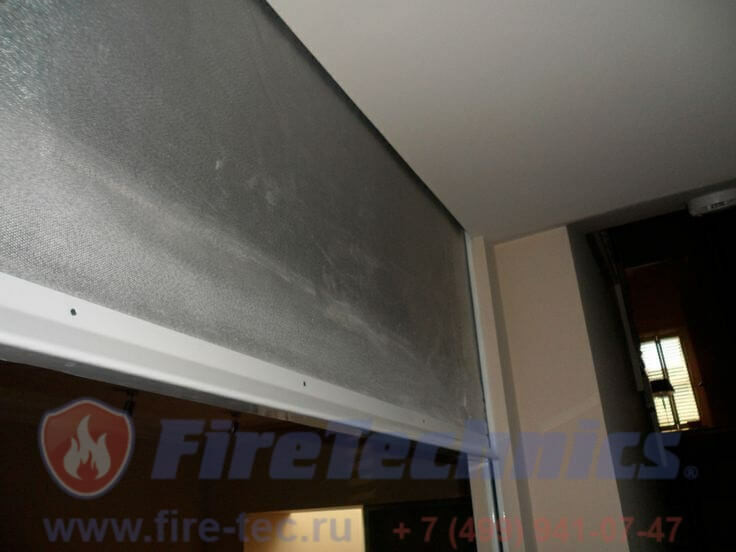 When planning buy fireproof curtains (video about them you can find on our website), you should pay attention to their main quality indicator – fire resistance. Two criteria are important here: the maximum time interval during which the shutter retains its own thermal insulating qualities – denoted by the letter “I”, as well as the time of preservation of the integrity of the structure – is marked “E”. Both of them are calculated in minutes. 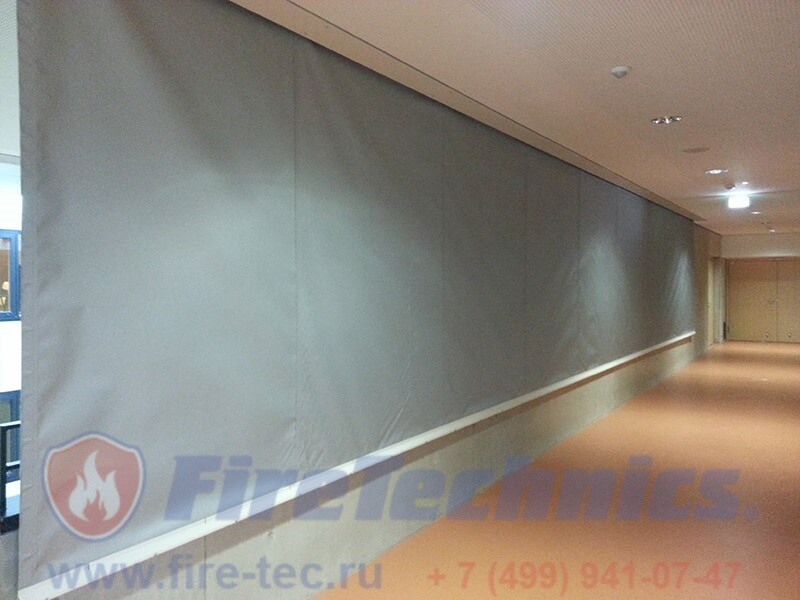 Fire-prevention curtains in St. Petersburg and other cities with the EI60 and EI120 markings are very popular today. Different figures indicate the degree of their fire resistance. And if the first work without irrigation, holding the fire for an hour, the latter – with irrigation water, and, twice as long. 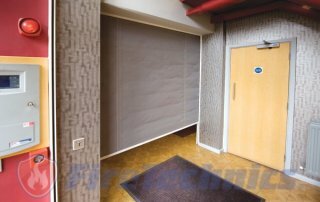 Fireproof curtains EI120 at the moment it is considered the best variant of the design providing fire safety for the most different buildings and conditions of use. For two hours, while the veil keeps the flame and products of burning, you can make safe human evacuation and save the fire from the fire and wait for the firemen to arrive. 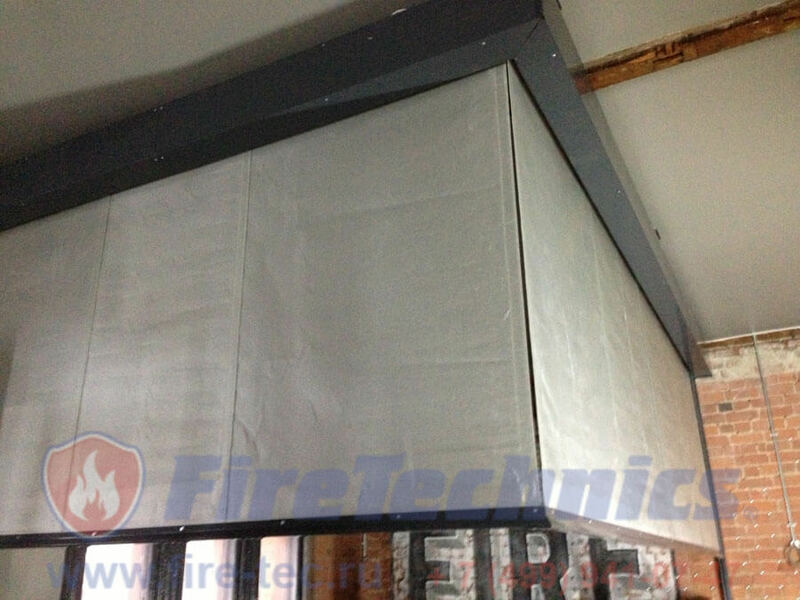 These fireproof structures created by the manufacturer with a world-wide name of the company “FireTechnics” are designed to divide the premises in case of fire on the so-called. “Fire-holding” compartments designed to prevent the spread of fire throughout the building perimeter, in order to protect people and property from the harmful effects of fire. 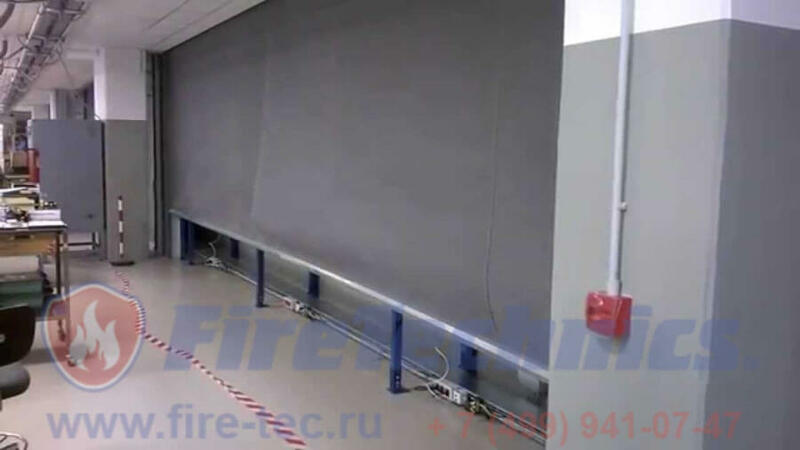 Manufacturing of fire-prevention curtains with a high fire resistance limit EI120 and additional water irrigation guarantees an effective evacuation for 120 minutes with a flow of just over seven liters per minute per 1 meter. 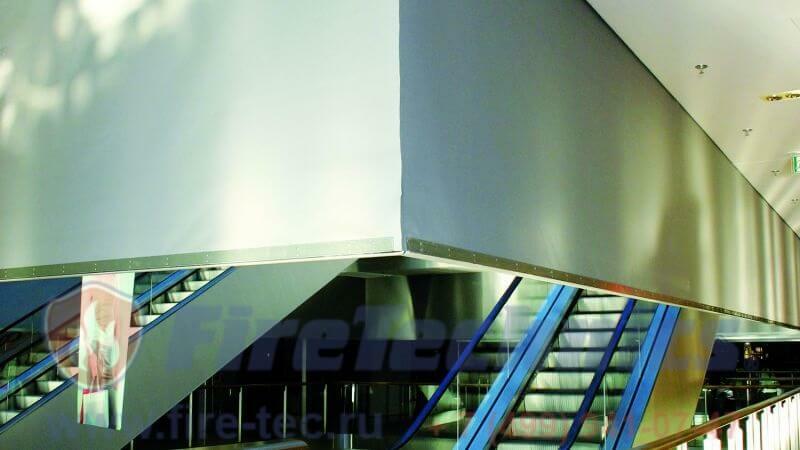 In the usual position FireShield fire curtains are under the ceiling, without interfering with the movement of the room. 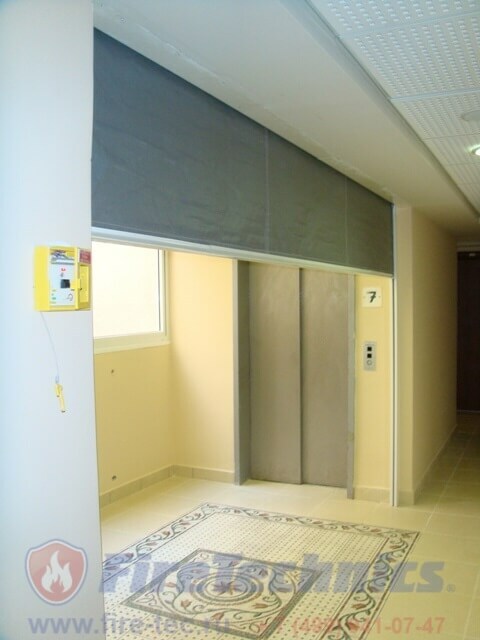 When an alarm is triggered, this curtain can be lowered and without the use of electricity, using only gravity, which affects its lower bar. 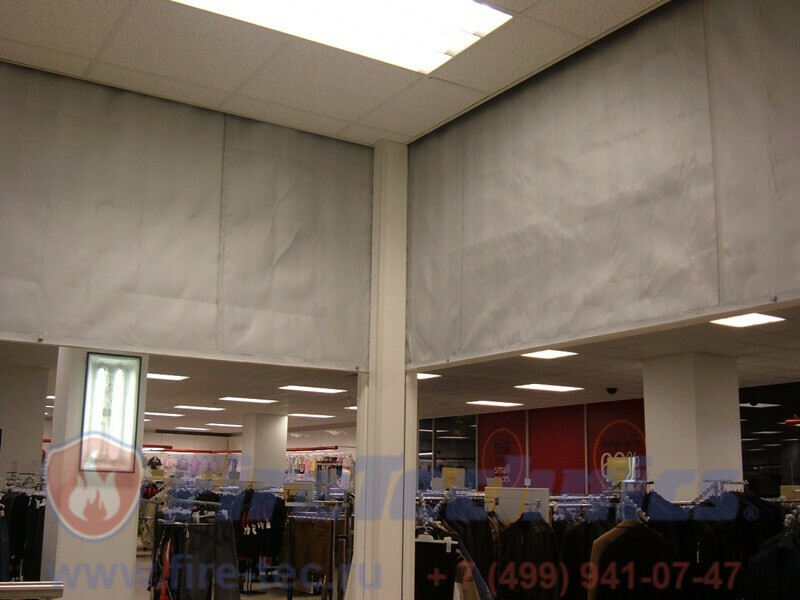 It goes down at a speed of about 0.2 m / s. Management of fire-prevention curtains When power is cut off and the motor is de-energized, it is not difficult. Work mechanism will continue for another three days thanks to the built-in battery and management unit, coupled with the drive system Gravigen. 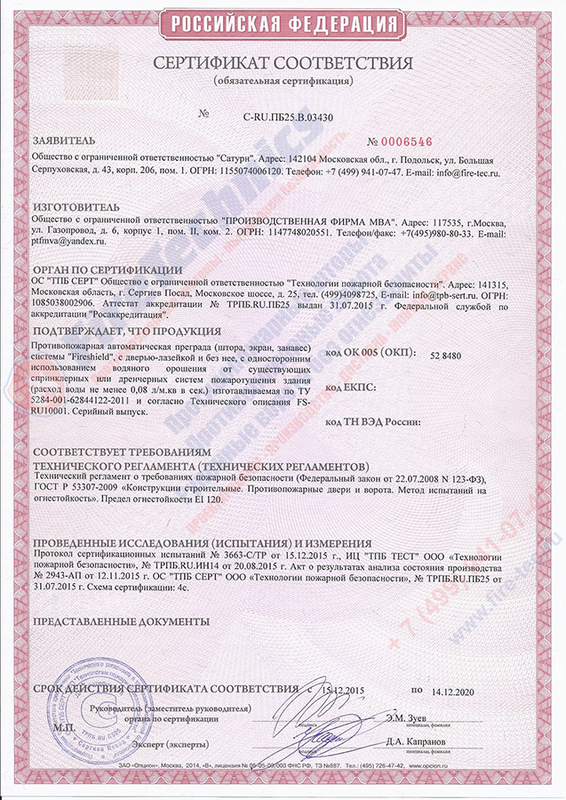 As an option, it is possible to order installation of a door-loophole (however, this can not be used as a passage for evacuation, or emergency exit). Premium – fire-resistant period is the same one hundred and twenty minutes with water irrigation 7.3 liters. in a minute. 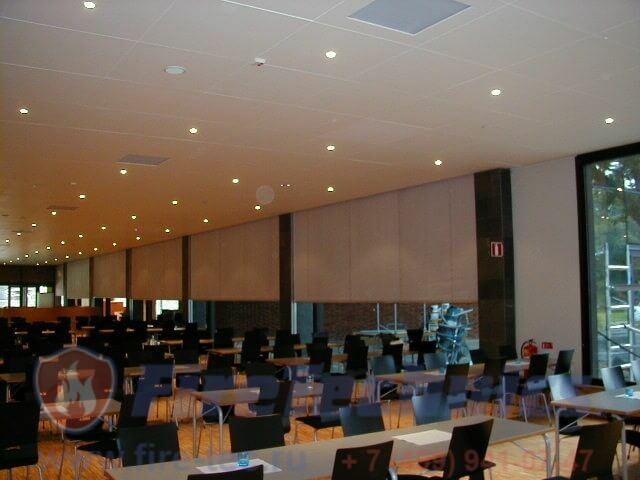 The maximum size of such curtains can be 24X10 m.
Division of large spaces into small compartments. 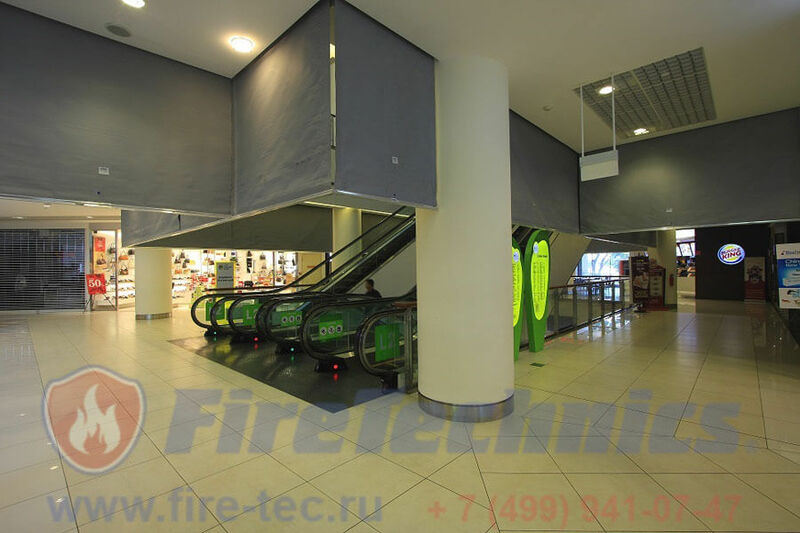 Fireproof curtains Yaroslavl, Ekaterinburg, Orenburg, Saint Petersburg – The company “FireTehnics” is ready to satisfy the requests in the high-quality fire-and-fire equipment, which has excellent quality and reliability of individuals and legal entities not only throughout Russia, but also beyond its borders. Box – it includes steel galvanized panels, whose length can reach three meters, and if necessary can increase due to docking. The dimensions of the box are determined by the height of the opening, which needs overlapping. So, the standard size is 20X22 cm with no more than 400-cm height of the opening. If it is higher, a 33x33cm box is ordered. It can be painted in any color according to the RAL table. The winding shaft is made of a steel pipe inside which a motor is built in. The latter starts the rotation of the shaft, on which the fire curtains, the price of which we are very available, are wound. 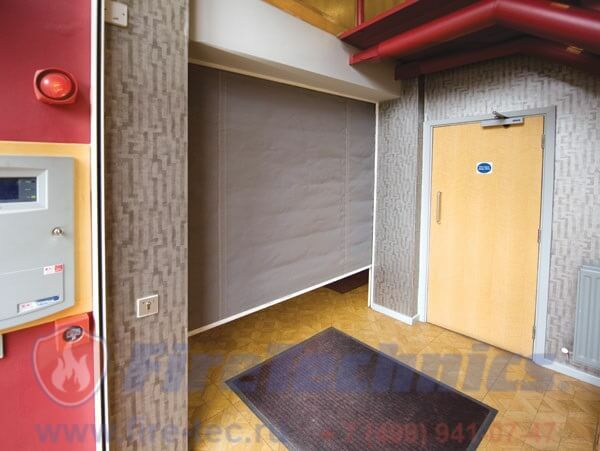 Cloth for curtains with reinforced fire protection is applied corresponding – high-strength fiberglass reinforced with a grid of stainless steel fairtex 1100. With a thickness of only 0, 63 mm, the weight of a square meter of this fabric is 660gr. 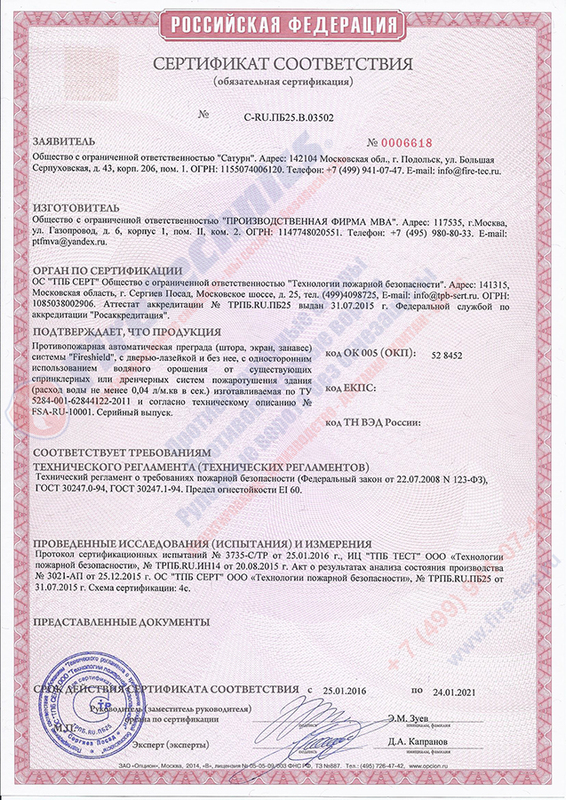 It can boast of non-toxicity and the presence of a certificate of non-combustibility of the state pattern. 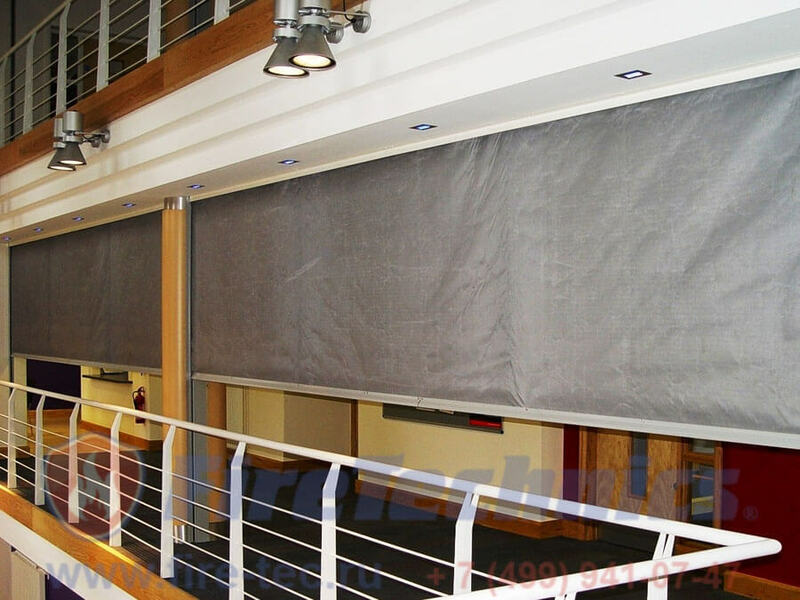 On the side of the curtain cloth of less than 7-meter width (the standard series) are attached metal bunches that prevent the canvas from leaving the guide rails. In the package, premium bouquets are replaced with pockets that guide the fabric along the bars of the so-called side tires. 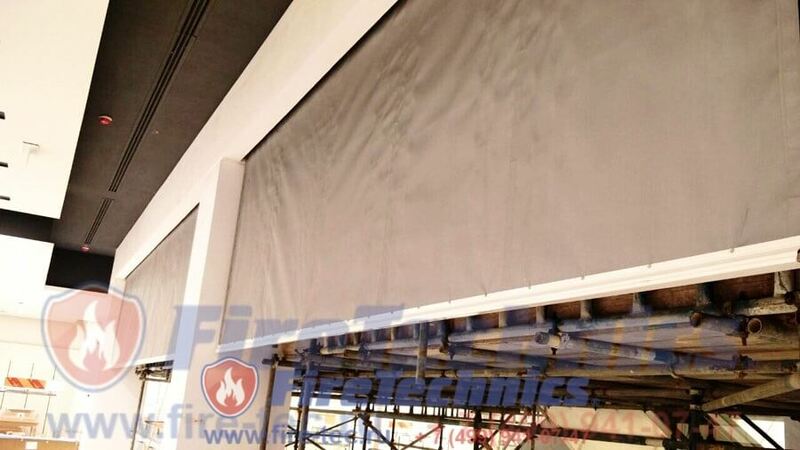 The guide rails are bars in the side rails, which according to the fireproof curtain instructions are designed to counteract high pressures and improve the tightness, as well as the noiselessness of lowering. The cut-off tire is made of bent profiles and is intended for fixing the web in the unfolded state. It ensures tight closeness of the curtain to the floor, and also accelerates the lowering of the blade in case of fire. 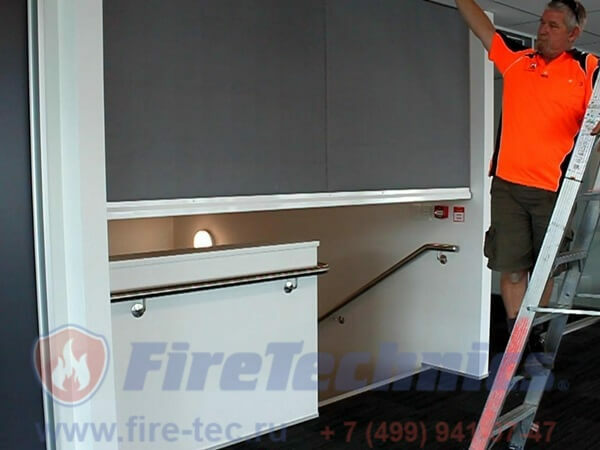 Engine – the ei 120 fire protection blind instruction reflects that their fabric is lowered under the weight of the lower cut-off tire and the requirements for the process itself are described in European regulations. In the middle, the canvas unfolds at a speed of about 0, 2 m per second. Control unit KMS-EV-4.0 – are controlled by curtains with electric drives by means of specialized units in remote mode, or automatic. In the latter case, feeding from the accumulators installed in the unit, it falls with an average speed of about 0, 15 meters per second. Door loophole as an option. 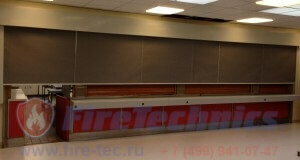 Why the FireShield curtains, rather than the products of competitors? We offer turn-key projects, starting with the design of the most effective curtains and ending with their competent installation. 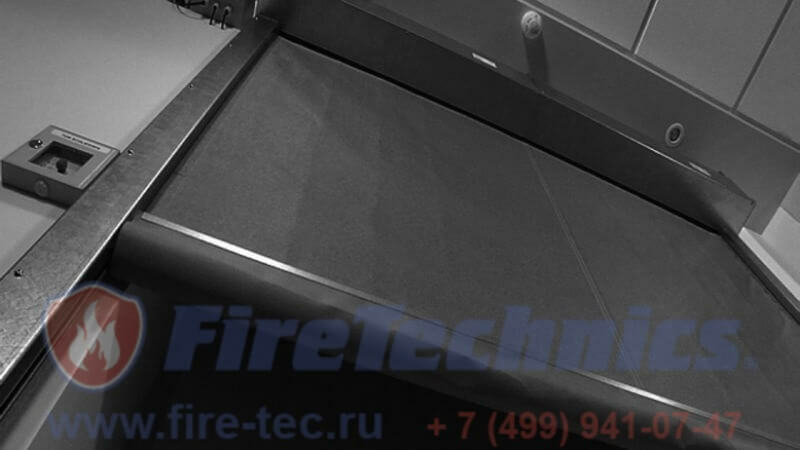 If you have any questions about the device, features, features, purchase, installation, or repair of fire protection curtains with EI120 irrigation, do not hesitate to call our qualified managers who will be happy to help you decide. 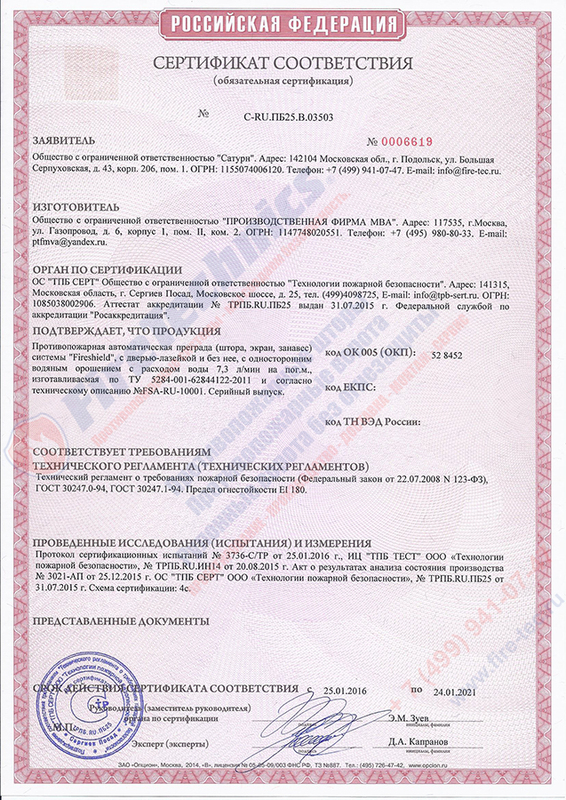 The highest level of service offered by us and one of the most advantageous prices in Russia for fireproof curtains from the manufacturer will allow you to secure the building entrusted to you with almost 100% efficiency! 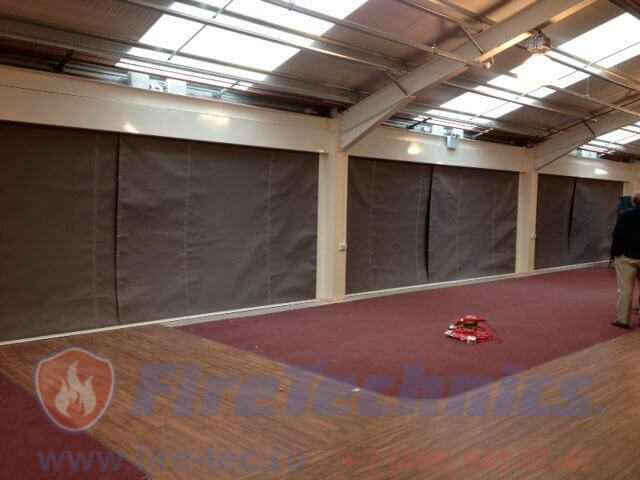 Fire curtains with DISCOUNT only now!